A click-through rate is how many times somebody clicks on something as after seeing it a certain amount of time. if you have 100 impressions and you have a 2% click-through rate, that means out of the 100 people 2% of people clicked on it and that resulted in two visitors to your website. if you go inside of Google search console, Google search console has a report that's going to show you the pages that you have inside of Google and what the click-through rate is for those pages and what the keywords are that those pages are ranking for and how many times those keywords have been clicked on. the most important thing is to look at the pages, look at the click-through rate for those pages and the keywords associated with those pages determine a baseline and then try to determine which pages have a really good click-through rate and then which pages have a really bad click-through rate. 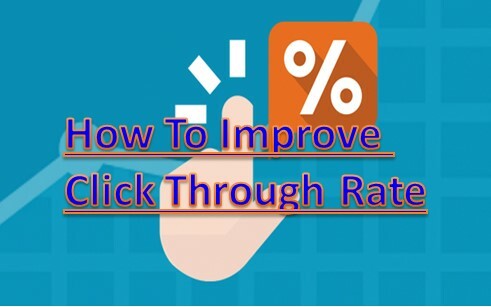 Those ones that ever really good click-through rate take a look at and try to think why do these pages have such a great click-through rate and for the ones that have a really bad one put those into another bucket because those are going to be the ones that you're gonna want to improve. once you know the ones that you're going to want to improve a great thing to do is look at your AdWord's ads, try to find out the ads that you have that have actually the best click-through rates on them. take a look at those and then also take a look at the pages inside a Google search console that have the highest click-through rates. try to figure out the similarities between the two and then look at the specific content that you have that isn't performing as well and develop a series of titles in descriptions that are going to be able to be showing up in Google. you know that you have the right information in the index make sure you put an annotation inside of Google Analytics so that you can save that information and you're gonna want to keep an eye on it and look at your period over period report inside a Google search console. another a couple important things to think about in regards to click-through rates is that many times titles and descriptions are written on websites on a template by template basis. in many cases, this is done because you're using schema.org on the page and Google has determined that you have a high-quality website schema.org is just something that you put in the code of your website that gives Google a little bit more information about the page.